I looked and saw the creation of the universe and of the planet Earth. I looked and saw an American family. The entirety of it was life itself as it has evolved through millions of years of impressions and booms. Terrence Malick’s The Tree of Life is about these equally enormous forces. It is as ambitious a film as I have ever seen, certainly one of the most visionary works of cinema in recent decades. It is difficult to narrow in on what the film is about. It is not a traditional narrative. In fact the film in form and style is entirely experimental, and the scope of the story is vast. We begin with light, the basic building block of the universe, and we see a woman, Mrs. O’Brien, receiving a letter. She obviously belongs to the 1950s. It is a death notice; her son has died at war. We follow her eldest child, Jack, as an adult in present day New York. He is trying, as his mother did, to make sense of his brother’s death, and in these early scenes time does not exist. Terrence Malick cuts back and forth, to the mother as a child, Mr. and Mrs. O’Brien, Jack’s parents, as newlyweds and after their son’s funeral, where Mrs. O’Brien asks God what has led to her son being killed. Malick then shows the most startling and insane sequence: the creation of life. Light, explosions, lava, earth, water, the elements; single-celled organisms and then land creatures, dinosaurs, and always, always, trees. Though the film opens with a quote from The Book of Job, Malick does not show us the bible’s creation of man. There is no Adam and Eve, only the building blocks that were laid to waste for our arrival. Among other things the film is about spirituality, about metaphysics, more than religion. But can anyone answer truthfully why God would take this woman’s son? Mrs. O’Brien offers to her children two ways through life: the way of Nature and the way of Grace. Are these opposing forces? Do they represent the different philosophies of mother and father, their own ways of raising their children? Mr. O’Brien believes in toughening them up, preparing them for a viscous, dog-eat-dog adulthood, whereas Mrs. O’Brien wants them to love every flower, every leaf, uniquely. Whether Nature and Grace stand for the feuding parents is really irrelevant when considering if Nature and Grace can co-exist. This is one of the many questions Malick seems to be asking. Are we our own creation, led to this point by a history of its own making, or has God shaped us to be like Him? But then wouldn’t God, Nature, and Grace be the same entity? Is the film arguing that religion is a convention of morality, that a “civilized” society cannot function without an institution to hold its shame in place, and that what some call God does not exist? I’m sure many would disagree but in this film, like in any great work of art, we are not given answers. Any interpretation is valid. The special effects work as they seldom do in modern movies: they are a part of a philosophical search for meaning. By juxtaposing an American family with the creation of the universe, Malick is suggesting some big questions. The reel-long sequence is stunning, and Malick pulls it off. The first time I saw the picture, not expecting anything like what I was about to see, I was stunned. My jaw dropped and it felt as if I did not breathe for the entire sequence. When I saw the film again I surprisingly was not as awed. The visual effects are still great, beyond brilliant, utterly convincing (except for the dinosaurs—they lack realistic texture). I hate to admit it but the sequence comes off more as pretentious and lacking in the same drama that will follow. The sequence is still powerful but the existence of a family, the true meat of the film, is far more fascinating. Terrence Malick has created an impression of family life like I’ve experienced only once in my life: while living my youth. I am only 25 years old. I did not grow up in the 1950s but my father did. And he raised me in a similar fashion as Mr. O’Brien did his kids. And my mom was always more lenient and affectionate and playful. As I looked at the screen I felt I was watching fractions of my own childhood. There’s a sequence mid-way through the film where Mr. O’Brien goes away on a business trip, and Jack and his brothers are excited and playful. This was my mood when my dad was at work or away for long periods of time. There was a weight lifted off of the house, but looking back now I realize that a great deal of the hostility was imagined, and that my insecurities around my father manifested themselves as anger and repression. But I was stunned to see this in a movie. To hear Jack whisper the things he’d like to say to his father while he is being disciplined is something I can easily relate to. At one moment he asks God to kill his father, and sadly this too is something I can relate to. There are also depicted in the film moments of beauty, such as the scene when Jack kisses his younger brother’s arm twice. It brought tears to my eyes because I could remember similar moments of peace with my own brother. Maybe my experiences do not parallel the film so much as Malick has touched upon what it is like to be in a family, the joys and pains and every emotion in between, but however artfully I can describe Malick’s work, the simple fact is that it touched me deeply. Jack seems to be having a crisis of faith. He notices in his young age a lack of action on God’s part, and this silence is so frightening to him that he acts out. He says to himself and to God after witnessing a kid his age drown in a pool, ‘There’s no reason to be good. You just do what you want to.’ I don’t know the denomination of the O’Brien’s church but I was raised Catholic, and many of the same practices and hostilities existed in my church and in my younger relationship to God. I have since lost any notion of divinity, but that’s not important. To Jack, God seems linked to his father. They have the same will, the same authority. Both seem to preach, ‘Do as I say, not as I do.’ This causes Jack more pain, and at one point he thinks something about his father that I truly fell: “You wrestle inside me.” This is an issue that a repressed, 1950s Christian society probably felt a lot, and through the simple action of shushing, like when Jack’s mom stops him from asking embarrassing questions in public, people were raised to keep these thoughts or emotions inside. That’s what men do, civilized people. And it is maddening. The way Malick directs the moments in this family’s life is astounding. The camera never once functions as we think it should. It moves like an eye: free-wielding, focusing on something and then quickly turning to something else, always curious about what’s next. The film is more a memory. Malick creates impressions of what it’s like to be a kid at any age, but he does a particularly great job in recreating a realistic 1940s / 50s. Jessica Chastain’s hair is never perfectly quaffed like in traditional period pieces, the lawns are not even, green fields of grass; they have weeds and dead spots. The streets are laid with browning petals and potholes, and the clothes are of their time, not a recreation. Malick’s camera moves through the space of the 1950s in a most anachronistic fashion. In my mind at least, when films are set in 1950s America their cameras usually recreate the cinematic style of the era: careful, expressionally-lit compositions mounted on tripods. Camera angles lining up to the characters’ points of view, absolutely no hand-held work. The Tree of Life uses rather liberally the Steadicam, and the effect is dreamlike and haunting, and it recreates the mood of life back then, at least as I’ve imagined it. I hope come Oscar time the Academy remembers this film. I know—who cares about the Oscars? 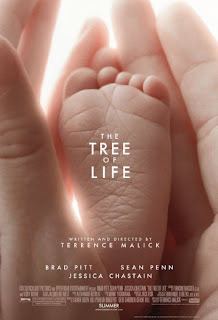 But it looks like the best picture of the year is an American effort, and if the Academy Awards truly reward the best in American cinema then The Tree of Life should be nominated in several categories. Best picture, director, screenplay, editing, special effects, costumes, make-up, and acting. The acting category is going to be tricky. This is Terrence Malick’s film. His performers merely dramatize his vision, but there are several stand-out performances in a film filled with perfection: Brad Pitt and Hunter McCracken. Pitt plays Mr. O’Brien, and he deserves to be rewarded for this performance. He is not a cruel man; he is someone of his time, raising his children as he was probably raised himself. Pitt gives off every facet of this character and a best supporting actor nomination should come his way. McCracken plays the young Jack, and this character is the true lead of the film, though the film is intentionally plot-less. I did not like Jack. His father’s bullying is already manifesting itself in his violent thoughts, his repression, his lashing out at his brother in one scene and at the environment in many others. He defies his loving, lenient mother in a heartbreaking display of rebellion, but that McCracken is so hypnotic that he can carry an unlikeable, subdued role is impressive. In all likelihood the Motion Picture Academy will not nominate him at all and give Brad Pitt the nomination for lead actor. Such is the history of the Oscars. Jessica Chastain needs to be mentioned as well. Her performance is magical—I am again surprised that a film dominated by its director can contain within some of the great performances of the 21st Century. Some critics have said her character of the mother exists outside of the bitterness and stern qualities of the world and of her husband, but Mrs. O’Brien is another archetype of old-fashioned American parenting. We see she does not like her husband’s approach, and as it would in real life (and undoubtedly has nationwide at every point in time) this sours their marriage. But either through love, commitment or society they do not divorce. Malick’s handling of the marriage and Pitt’s and Chastain’s is so powerful, and Chastain is beautiful and mesmerizing and I wanted to signal her out as well. The final scene, which I will not detail, is, I think, about forgiveness, about reconciling everything and everyone you’ve ever known to the fact that something has happened; that a brother has died; that parents are not perfect, age, and will always be a moving force in one’s life. But what is to be forgiven: Nature or Grace? What was it that took away this child; that began an exploration through the creation of the universe? Was it the will of God or the chance of fate? Did the way the planets formed influence the decision? Had a petal fallen too fast or withered on the plant for too long? Or had God decided it was time to take back what is his? Malick does not provide answers. He creates a scenario that is open, and the scene on the beach with strangers and characters we’ve gotten to know on this odyssey is a metaphysical experience rendered on film, one of the most moving and inexplicable experiences I have ever seen. I am not embarrassed to admit that the film brought tears to my eyes. In quick moments I had experienced what in actual time has taken a short lifetime. With all this I haven’t scratched the surface of this movie. It is an event, something like we haven’t seen in the art world for some time. It might be premature, but The Tree of Life will stand against the works of Ingmar Bergman and Andrei Tarkovsky as one of the most thoughtful and ambitious projects ever filmed. I had my doubts when I read others saying this, but I’ve seen it twice, with about a month’s break in between, and I was moved to tears more the second time. Go see this picture; if you see nothing else in a theater this year you will likely have seen as great a movie as can be made.